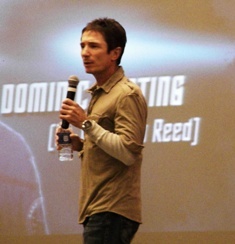 The weekend of August 24-25 I had the opportunity to see actors Connor Trinneer (Commander “Trip” Tucker) and Dominic Keating (Lt. Malcom Reed) at Seattle’s Official Star Trek Convention. Though I have been a long time Trek fan – basically as far back as I can remember – I have only recently discovered Enterprise. Like a lot of Trek fans, I didn’t pay much attention to the show when it aired on television. I don’t know the specific reasons why. I guess I thought I wasn’t interested in a prequel to the Trek. I’m sorry I felt that way, because now that I have watched seasons one and two on Blu-ray, it is quickly becoming a favorite Trek series for me. I was excited to get a chance to see Trinneer and Keating in person. 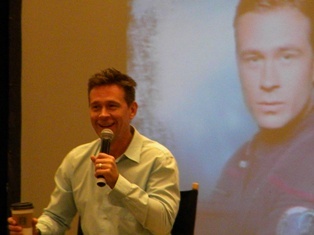 Having grown up in Washington, Trinneer brought a personal connection to the Seattle convention. Trinneer grew up in the small town of Kelso and attended Pacific Lutheran University, where he played football. His decision to give up football and turn to acting came about after meeting a girl at a party, who made the suggestion he try out for the play she was involved with. The audition paid off, and Trinneer found himself on the path to becoming a professional actor. But he’s first to say that it’s not the life of glitz and glamour some people believe it to be. He lives a normal life with his wife and son, going off to auditions and taking parts when they come along. When asked if there are any television shows he would like to be on he quipped, “I just want a job.” Snagging something like Enterprise is a rare occurrence in the average working actor’s career. He did go on to say that one of his favorite current shows is Downton Abbey, but he doesn’t expect to be called for that one any time soon. While discussing the fate of his Enterprise character, he says he liked that Trip got a complete story, though he’s aware there was some mixed fan reaction. When he read the script for “These Are the Voyages…” his first question was, “Are we really cancelled?” “Yeah, we’re done,” he was told. “Then I love it,” was his response. 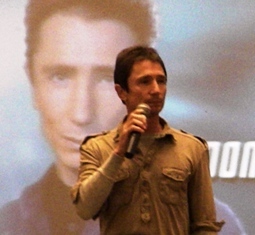 The following day Dominic Keating took the stage in front of a rather enthusiastic audience. When asked the usual question about whether he was a Trek fan before Enterprise, he had one the most unique answers I have ever heard. Oh, and if you are wondering, Keating is not as big of a fan of pineapple as his character. “I can only tolerate it if it’s in a smoothie,” he told one curious convention attendee. While briefly discussing some of the problems Enterprise faced during its four-year run, he shared one of the more bizarre things I’ve heard concerning Star Trek. It was suggested by the studio that Enterprise feature a new boy-band in the mess hall each week (if you find this hard to believe, check out the special features on the season two Blu-ray for confirmation!). 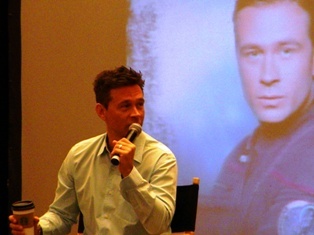 Both Keating and Trinneer were asked about Enterprise’s much-maligned theme song, “Faith of the Heart.” Trinneer admitted the song was a little cheesy, and not exactly what comes to mind when you think of Star Trek. Keating said he didn’t have a problem with it, before he launched into a funny (and somewhat bawdy) parody of the song. If you get a chance to see either of these guys in person (check Creation Entertainment for upcoming conventions), you won’t be disappointed. They are both congenial, funny, and down to earth. For the inside scoop on Trinneer’s pirate impression – “I told him it was great,” Keating deadpanned, or Trip and T’Pol’s romantic possibilities, “She’s only in the mood once every seven years, and she never laughs at his jokes,” Trinneer said jokingly – you won’t want to miss the chance to check them out.